Keep in mind that their menu changes often so check their easy-to-use website frequently where you can also order online or make reservations. Established in 2000, Glatt A La Carte is a NYC-style steakhouse located right in the heart of Boro Park. Owner Binem Naiman and Chef Mark Green have worked together for over a decade to bring elegance and sophistication to their diners. The chic upscale venue that can be mistaken for a catering hall, features elegant décor, with the dim glow of the lights and the white winter branches warmly lit from below against the back wall. 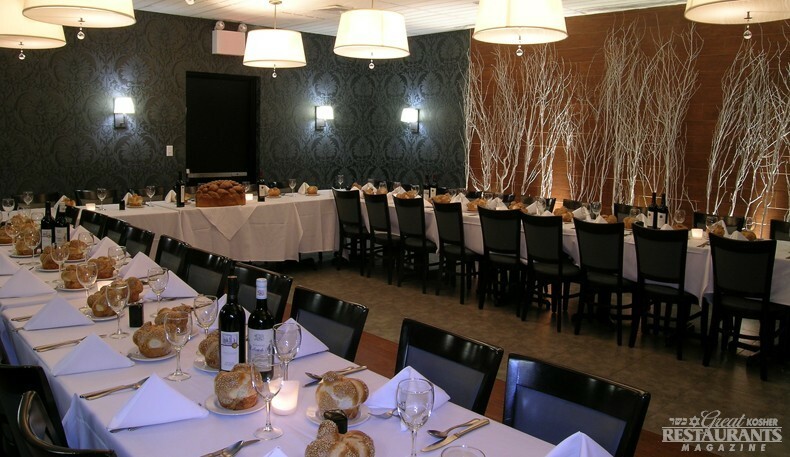 Their large private party room makes it a perfect location to host a family celebration or a professional meeting, while inconspicuous white screens between some of the tables in the main dining room assure a sense of privacy for a romantic night out that no other busy restaurant can offer. Combined with a welcoming invite from the owner to each, and every individual and flawless presentation of each of the dishes (even children’s menu is presented with a flair), Glatt A La Carte, has become one of Brooklyn’s finest dining attractions. Every dish, from juicy steaks to butter-smooth mashed potatoes to a plethora fanciful desserts, seem to be perfected to a delicate science. The dinner menu offers an array of beef dishes including a 40oz Rib Chop that wows diners, and their very famous Roasted Prime Rib that will satisfy you with the aroma alone. The appetizers get a fair share of compliments too- particularly the Grilled Sweetbreads in Chimichurri sauce, and the Texas Beef Spring Rolls- pulled seasoned brisket, slow smoked, fried and served with a tasty dipping sauce, which are extremely satisfying to the taste buds. Patrons of this restaurant also rave about their variety of freshest sushi. Meanwhile, be sure to try one of their wines with your prime rib steak or perhaps a glass of dessert wine to complement the Lava Flow, a rich chocolate cake with a hot molten center to serve as the grand finale. Glatt A La Carte also boasts a full line of homemade sauces and rubs which are available and bottled for purchase. Keep in mind that their menu changes often so check their easy-to-use website frequently where you can also order online or make reservations. Also make sure to follow their Facebook to get all the recent updates, and join others who are excited about Glatt A La Carte being an exquisite Brooklyn destination for fine dining. Notes: New sushi menu. private party room, wine and beer menu, children's menu, take-out, lunch and dinner specials.